Give back and make the world a more equal place. Amazing things happen when we work together to help others. Save the date for Dreamforce ’19 and join us for four more days of making the world a more equal place. Daily giving-back activities give you hands-on opportunities to make an impact and help the people who need it most. Last year, we raised $1 million toward ensuring that everyone has the tools needed to get a great education and join the workforce. This year, we can make even more of an impact. Thank you for playing Dreamforce Quest and helping us raise $1 million toward ending homelessness in the Bay Area. We are proud to support Larkin Street Youth Services and Hamilton Families, two local organizations that provide support, stability, and opportunity to the homeless in our communities. Together we can help give them the foundation they need to live healthy lives. Check out students from Oakland and San Francisco Unified School Districts, plus Hamilton Families, as they design and prototype solutions to address water needs in underserved communities. Moscone West, Kids Coding Zone, 9:00 a.m.–4:30 p.m.
Adventurer’s Auditorium at Westin St. Francis, 12:00 p.m.
Salesforce.org Idea Forum: What if … your cause sparks a movement? Yerba Buena Forum at Yerba Buena Center for the Arts, 9:00 a.m.–9:40 a.m.
Salesforce.org Idea Forum: What if ... companies hired based on potential, not credential? 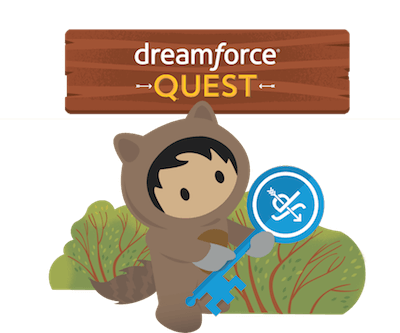 Adventurer’s Auditorium at Westin St. Francis, 12:00 p.m.–12:40 p.m.
Moscone West, Kids Coding Zone, 9:00 a.m.–2:00 p.m.
Embody the Salesforce mission of giving 1% of time back to our community by stuffing holiday bags for children. These bags will go to more than 100 families that lack the means to buy gifts. Take a break from the action and join our community and our partner Children of Shelters and help to make holiday memories for some well-deserving kids. Borgia Room, Mezzanine Floor, Westin St. Francis, 10:00 a.m.–11:30 a.m. and 3:00 p.m.–4:30 p.m. Check out our Sustainable Cities of Tomorrow Makers Faire featuring forward-thinking designs created by students from Oakland and San Francisco Unified School Districts. Stop by and vote for your favorite design. Borgia Room, Mezzanine Floor, Westin St. Francis, 10:00 a.m.–11:30 a.m. Leading the way: Join 400 young adults from Bay Area Workforce Development partners for our afternoon speed networking session. Help these leaders of tomorrow build their professional networks and strengthen the skills they’ll need to land their dream job. Sign up to participate. Moscone South, Esplanade Level, 3:00 p.m.–4:00 p.m.
Adventurer’s Auditorium at Westin St. Francis, 3:00 p.m. Check out students from Marin Country Day School as they design and prototype solutions to address water needs in underserved communities. Moscone West, Kids Coding Zone, 9:00 a.m.–12:00 p.m.
Get ready to rock for UCSF Benioff Children’s Hospitals. We’re proud to support UCSF Benioff Children’s Hospitals through our legendary Dreamfest benefit concert. When you join us for a once-in-a-lifetime VIP experience, your generous support will help UCSF Benioff Children’s Hospitals provide world-class care to every child who walks through the door. You’ll also be contributing to cutting-edge treatments, medical research, and breakthroughs in care that will be felt across the globe. The spectacular evening will begin with an exclusive cocktail reception in City Hall, followed by our big-name concert, and closing with a legendary after-party, making Dreamfest an unforgettable event. Get your VIP experience today. Connect to the causes you care about. Join us during Dreamforce at the Philanthropy Cloud keynote, as we bring your impact to life. Learn how Philanthropy Cloud connects corporate employees and nonprofits in a new digital marketplace for doing good. Hear from Trailblazers like adidas and Sprint on how they are using Philanthropy Cloud to drive meaningful impact in their communities. During Dreamforce, when you make a donation to help end homelessness for LGBTQ youth, you’ll receive the popular Pride Astro Plushie, provided by the Giving Back and Equality teams. Stop by the Dreamforest to see the stories of the mothers and fathers, sons and daughters who now have a place to call home. Through Dreamforce Quest, we’re out to raise $1 million to help people on the streets find a safe space of their own. For many years we’ve taken big steps to reduce our collective carbon footprint. We make every attempt to conserve resources, source responsibly, reduce waste, and inspire our attendees to do the same. We are also hosting our inaugural Climate Summit at Dreamforce — the first of its kind — and will feature three inspiring keynotes. The topics will be climate and the oceans. And this year, attendee lunch will be 100% beefless, which will conserve an estimated 10 million gallons of water. So let’s get ready to experience our most sustainable Dreamforce yet. Check back to find out more exciting updates in our road to Dreamforce 2018 and join our Trailblazer Community group Sustainability at Salesforce. Learn more about our ongoing sustainability initiatives at salesforce.com/sustainability. If you’re interested in offsetting your travel-related emissions, check out this page. Find out more about Sustainability at Dreamforce.